HOGAN TO SEEK SCHOOL START REFERENDUM: As Democrats seek to override his executive order forcing Maryland’s public schools to wait until after Labor Day to start classes, Republican Gov. Larry Hogan pledged Wednesday to fight back with a referendum, Luke Broadwater and Pamela Wood of the Sun report. Democratic lawmakers are advancing a bill that returns the decision of when to start the school year to local school boards. The measure moved out of committee by a 7-4 vote along party lines Tuesday and is headed to the Senate floor Thursday morning. The legislative action renews one of the biggest firestorms between Hogan and the legislature, just a week after Hogan touted his ability to collaborate with the Democratic-controlled General Assembly, Ovetta Wiggins of the Post reports. SOLITARY CONFINEMENT: Several General Assembly bills introduced this week take aim at reforming aspects of how Maryland prisons use restrictive housing. 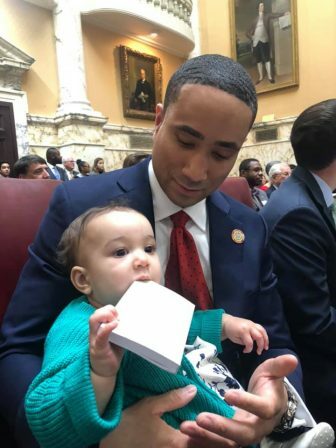 Proposed Senate bills would add regulations to how the Maryland Department of Public Safety and Correctional Services isolates incarcerated pregnant women and minors, Cameron Dodd of the Frederick News-Post reports. ELECTIONS CHIEF GRILLED AT BPW: Gov. Larry Hogan and Comptroller Peter Franchot on Wednesday grilled the administrator of Maryland’s elections — after problems on Election Day in November caused polls to stay open late and postponed the release of results for hours, the Sun’s Luke Broadwater reports. The Maryland State Board of Elections did not post election results online on Election Day until after 10 p.m. — two hours after polls were scheduled to close in the state. Hogan said he and many others were frustrated they had had to wait for hours for the results to be announced. BILL WOULD STRIP APPT. VETO FROM STATE SUPER: A Baltimore County senator is pursuing a bill that would remove the ability of the state superintendent of schools to disapprove of local school leaders. The legislation stems from the controversy last year over the Baltimore County school board’s appointment of interim Superintendent Verletta White. While a majority of the board voted to offer White a multi-year contract, state Superintendent Karen Salmon blocked her appointment in an unprecedented move, Danielle Gaines of Maryland Matters reports. FRANCHOT CONTINUES TO HIT BACK: Maryland’s top tax collector and enforcer of alcohol laws — at least for now — is vowing to shine a light on lawmakers and their associations with corporate special interests, writes Bryan Sears for the Daily Record. Peter Franchot told reporters Tuesday he plans to comment on the relationships between top lawmakers and what he called out-of-state corporate interests intent on stifling the state’s craft brewing industry. “They’ve opened pandora’s box,” said Franchot. EASING TAX BURDEN FOR RETIRED OFFICERS: Gov. Larry Hogan stepped up his calls to the General Assembly for measures that would reduce the tax burden on public safety officials’ retirement benefits, writes Phil Davis for the Annapolis Capital. PATIENT BILL OF RIGHTS: Del. Karen Lewis Young (D-Frederick) has started the next steps to make Maryland the 28th state to have a patient bill of rights, reports Heather Mongilio for the Frederick News Post. Lewis Young appeared before the House of Delegates’ Health and Government Operations Committee to seek a favorable recommendation on her bill for the fourth time Wednesday afternoon, citing Maryland’s poor statistics for patient satisfaction, security and emergency department wait times. BILL WOULD ADD JUDGES TO CASE SEARCH: A bill to mandate the inclusion of judges’ names in Maryland Judiciary Case Search faced push-back Wednesday as skeptics questioned whether the measure would endanger judges or lead to public pressure affecting their decisions, Heather Cobun of the Daily Record reports. SOLUTION TO EXCESS MANURE STILL ELUSIVE: Since its 2014 inception, Maryland Department of Agriculture’s Animal Waste Technology Fund has handed out nearly $6 million to eight projects that promise to help farmers find uses for manure beyond fertilizing local fields. Its main target: the nearly 400,000 tons of chicken litter generated each year in Maryland. But of the four projects under way, none has yet to find a sure financial footing, The Bay Journal’s Jeremy Cox writes in an article that appears in MarylandReporter. OPINION: FUND ANNAPOLIS SERVICES: The editorial board of the Annapolis Capital opines Gov. Hogan left money out of this year’s budget to compensate Annapolis for hosting the legislature. Hogan should agree on next year’s funding with the speaker, restoring the money through a supplemental budget. Annapolis finances are always tight, and a loss of this amount for one year is an unfair hardship on city taxpayers. But Hogan’s actions show the importance of a funding formula to fairly compensate the city in a way that is protected from politics. SEN. SMITH TO DEPLOY TO AFGHANISTAN: State Sen. Will Smith, an officer in the U.S. Navy Reserve, will deploy to Afghanistan before the end of the General Assembly session, Luke Broadwater of the Sun reports. Smith’s office said Wednesday that the Montgomery County Democrat has received orders from the Pentagon to deploy to Afghanistan in support of Operation Resolute Support, in which 13,000 troops are providing assistance for Afghan security forces in their conflict with extremist groups. Smith, an attorney, is an intelligence officer in the Navy Reserve, writes Ovetta Wiggins in the Post. The seven-month stint also will take him away from his family — Annapolis lobbyist Camille Fesche and the couple’s 10-month-old daughter, Jacqueline — and it’ll force him to miss the final 10 days of this year’s legislative session, a hectic time when the fate of hundreds of bills will be decided, Bruce DePuyt of Maryland Matters reports. HOGAN CALLS FOR VA GOV TO RESIGN: Gov. Larry Hogan on Wednesday joined the chorus of public officials from both parties calling on Virginia Gov. Ralph Northam to resign, Arelis Hernandez of the Post writes. OPINION: HOGAN SNUBS KIRWAN: Political prognosticator Barry Rascovar opines in his Political Maryland column that Gov. Larry Hogan apparently doesn’t think much of the Kirwan Commission and its recommended improvements for Maryland’s K-12 classrooms. You won’t find that message in Hogan’s State of the State Address, or in his formal budget submittal. CUMMINGS TOUTS SARBANES BILL: U.S. Rep. Elijah Cummings delivered a fiery speech Wednesday in which he shared a promise his 92-year-old mother asked from him on her death bed a year ago. Cummings, who chairs the House Oversight and Government Reform Committee, delivered the heated speech during the committee’s hearing on H.R.1 — a bill on voting rights, campaign finance and ethics rules, Lillian Reed of the Sun reports. The legislation, called the “For the People Act,” was introduced by U.S. Rep. John Sarbanes, a Maryland Democrat and a senior member of the committee. MD DEMS NOT IMPRESSED BY TRUMP SOTU: President Trump implored Congress Tuesday to move past political gridlock in favor of bipartisan cooperation before he dug in on the border security fight that threatens to shut down the government yet again. Democrats in the Maryland congressional delegation weren’t impressed by Trump’s speech. They accused the president of repeating rhetoric he’s used in the past and exacerbating the partisan divide that led to the longest shutdown in U.S. History, Robin Bravender reports for Maryland Matters. LEAD IN SCHOOL WATER: A Montgomery County Council member is taking aim at lead levels in school bubblers and water faucets, advancing legislation this week to reduce the permissible level of the harmful metal that children can be exposed to in drinking water at schools, the Post’s Jennifer Barrios writes.